No matter the size of the city, local governments can help create the environment for local entrepreneurs to flourish. One of my favorite ways for cities, especially historically large cities, to support the growth of entrepreneurship and innovation inside the city limits is to invest in the idea of an innovation district. Barcelona, my adopted home, was one of the first cities in the world to recognize the potential to transform formerly industrial and low-value (sometimes even abandoned) land into hubs for the various actors found in vibrant entrepreneurial ecosystems. In Barcelona the innovation district, called 22@, represents 200 hectares of transformed land into a modern, cool, innovation hub which houses R&D activity for multinationals as well as thousands of startups. Cheap land, big-time investment in high band-width telecom infrastructure, incentives for startups to locate there and of course a health dose of incubators, accelerators, and other entrepreneurial support agencies. Mayors from around the world have come to Barcelona to learn from the 22@ story, and in many cases, such as Boston and Buenos Aires, to implement their own innovation districts based on adapted insights from 22@. Until recently, I thought that innovation district really only made sense in larger cities that have vacant land and already have significant traction in entrepreneurship, but just currently scattered throughout a city. Then I learned of Chattanooga’s efforts to grow its own innovation district. With a population of less than 200,000 and a legacy of industrial activity which, like most cities large and small, has declined substantially in recent decades, Chattanooga was facing an uphill battle to attract and retain young innovators. The city dedicated a 140-acre section of the formerly industrial area of downtown Chattanooga for the creation of an innovation district. Spurred on by the creation of 9,000 miles of a high-speed fiber network (a la Kansas City and Barcelona) Chattanooga is making the most of its resources. Urban innovation experts increasingly recognize that cities of the 21st century can no longer rely on top-down governance approaches to city transformation. Increasingly, cities are finding ways to engage citizens, not just in consultations on plans, but in the co-creation of solutions to make the city more sustainable. I refer to this as Smart Cities 3.0. Yet, how can cities shift to more reliance on citizens if the local school system is failing to educate future generations in ways that allow them to become active innovators in their community? In the late 1990s a concept called STEM emerged as a solution to this gap. STEM stands for science, technology, engineering and math, and the idea was to create special skills dedicated to providing students with the foundations required to become innovators in an increasingly complex, and sophisticated (and technology-enabled or driven) economy. STEM has been embraced as an education framework around the globe. Yet in recent years, many initiatives have been introduced to expand our thinking on what are the actual critical skills required of future innovators. Relatedly, educators and innovation experts recognized that students need more than the deep “hard skills” of the STEM curriculum but creativity through the arts may also be important to blend in to the educational framework. 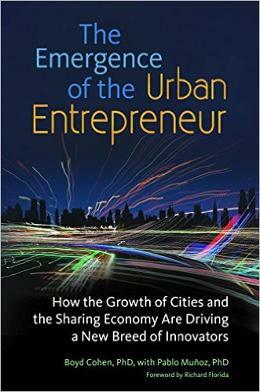 This is part of series of articles based on The Emergence of the Urban Entrepreneur, by Boyd Cohen and Pablo Muñoz, with a foreword by Richard Florida. It will be published in May. So, STEM shifted to STEAM. Yet there has been another recent addition to STEM that is really intriguing. Adding entrepreneurship to the equation creates ESTEAM: Entrepreneurship, Science, Technology, Arts and Math. I recently wrote about the role that collision density plays in facilitating frequent interactions between diverse stakeholders in urban innovation ecosystems. ESTEAM education programs facilitate a key blend of diverse skills between students to allow them to become important contributors to that collision density as they grow up. Some cities have managed to blend innovation districts and ESTEAM education by supporting an inclusive approach to educating local residents (in or near the innovation district) of diverse economic backgrounds. This integration can support future employability of youth with innovation district firms or perhaps be creators of new enterprises as well. Medellin (Colombia) is one such city actively looking to embrace inclusivity through such ESTEAM programs while growing a new innovation district (Ruta N). Because cities are more densely populated and frequently have high penetration rates of GPS-enabled smart phones, cities have become the primary source of growth of the sharing economy. But embracing sharing in cities goes beyond peer to peer sharing of under-utilized resources. Business to crowd sharing solutions are also emerging in cities and are playing a big role in enabling the growing masses of urbanpreneurs. Coworking spaces help indie urbanpreneurs gain affordable access to office space along with excellent support networks for supporting more “collisions.” Shared kitchens give aspiring foodie entrepreneurs access to high quality commercial kitchens for low-cost experimentation. Fab labs give aspiring makers access to 3-D printers, lasers, other tools, and of course other makers for creating new local products. Fab City is a concept that is emerging as an idea to convert cities into distributed maker spaces for “hacking the city.” Instead of one fab lab in a city, the Fab City concept is encouraging the growth of fab labs in neighborhoods throughout the city. With city support, such an approach would allow neighborhood-based civic entrepreneurs to create hyperlocal solutions to challenges in their community. But this doesn’t have to just exist in thriving metropolises. I believe small cities should also embrace the sharing economy. But instead of relying only on high-dense transactions and private business to crowd initiatives, small cities may need to take a more proactive role in financing and supporting the introduction of things like coworking spaces and fab labs. And because the density of many smaller cities may not be enough to support the collision density and vibrant startup rates of larger cities (which is often what is attracting the younger innovation generation), smaller cities may need to explore a sharing region strategy. Smaller cities can consider themselves part of a region which may have a collection of smaller cities who can collaborate in interconnecting activities and resources that could be attractive to certain types of urbanpreneurs. Many urbanpreneurs are leveraging digital technology to work with local and global collaborations and clients, suggesting that some percentage of urbanpreneurs are not directly dependent on being located in a large (and super expensive) city. Smaller cities should leverage this inherent benefit to attract such urbanpreneurs by collaborating with regional partners to invest in co-working spaces, even co-living spaces (housing coops) and of course high-speed bandwidth infrastructure. Some regions are also blessed with more natural beauty and access to outdoor activities (e.g. skiing, hiking, etc.) than their larger peers. This can also be used to attract urbanpreneurs who value easy access to these activities. Since smaller cities frequently have fewer human, financial, and infrastructure resources of the larger cities, and lower densities overall, they must adapt their strategies to take advantage of what they do have. For example, many smaller cities have a much more affordable cost of living than the larger cities. The super cities like New York, San Francisco, London, Hong Kong, and Tokyo are attracting thousands of younger people on an annual basis in search of better opportunities. But their cost of living is becoming increasingly prohibitive for many of this generation. Small cities may be able to pick up the slack. The massive urban migration we are experiencing in recent decades has created a global competition for (mostly younger) innovation talent. Like the overall population, entrepreneurs too are migrating to cities. But which cities they migrate depends on what kind of resources and collisions the city offers for aspiring urbanpreneurs. Innovation districts, strong education programs, and a vibrant sharing economy are tools cities can leverage to attract and retain urbanpreneurs. Executed properly, these initiatives can also support an inclusive approach to citizen co-creation towards a more livable and vibrant city.